We take a look at the performance of Dischem since its listing on the JSE and compare it to arch rival and long time listing Clicks group. So who has Mr Market been favouring since the listing of pharmaceutical and cosmetics retailer Dischem, or the old hand listing Clicks operating in exactly the same space as Dischem. Our interactive graphic compares the share price performance of both shares, over the last 3 odd years (of which Dischem's listing is included in the last 18 months). So which of the two shares has Mr Market been favouring? The interactive graphic shows the share price performance of Clicks over the last 3 years. As soon as users click on Dischem on the top left of the graphic the graph recalculates and shows the share price performance of both shares over whichever time period is selected by the user. The over the counter pharmaceuticals, cosmetics and health goods market has seen strong growth in recent years, especially with bigger retailers shops taking up dispensing of subscription medicines. This has led to the decline of old school pharmacies and nowadays the pharmaceutical market is totally dominated by players such as Clicks and Dischem. The image below shows the share price performance of Dischem and Clicks since Dischem's listing in November 2016. The image above shows that for the majority of time since its listing, Dischem's share performance has outperformed that of Clicks group (CLS). However a strong decline since end of April 2018 in Dischem's share price has seen older counterpart Clicks take the lead and outperform Dischem since then. The decline in the share price in Dischem at the end of April and early May 2018 smacks of insider trading as the financial results of Dischem was released 4 May 2018. Surely insiders knew the results were gonna disappoint and they dumped the share in the days leading up to the results publication of Dischem. On the flip side, Clicks has seen a strong surge in their share price since mid April, and this is largely due to their financial results being published on 19 April 2018. So it looks like investors wanting exposure to the sector, dumped Dischem and switched over to Clicks. The image above shows the share price performance of both shares Year to Date (YTD). While the ratio as calculated above is extremely high, and the divided yields extremely low and the PE ratios being pretty steep to, the sector they operate in is a very defensive sector (it will not really be affected by economic cycles, people will still require the goods they offer, whether the economy is growing or contracting, people will still get sick and need toiletries. Thus the demand for their products will always be there and this is part of the reason companies such as Dischem and Clicks trade at such high PE ratios as their sector trades on a premium to the market due to its defensive nature. 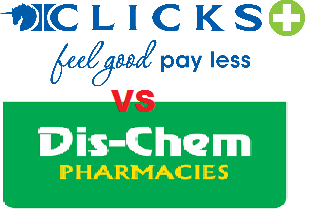 But looking at the above, it does look like the share prices of both are expensive and it seems that Mr Market liked Clicks' results more than that of Dischem, and as a result have decided to back Clicks instead of Dischem and due to this the share price of Clicks is currently outperforming that of Dischem.